I've always heard that gift giving etiquette for weddings allows for a whole year to find that perfect gift, or in my case perhaps it's craft the perfect gift? Well I'm here to admit that I completely failed with that timeline. I recently gave this letterpress print and wood type shadow box to friends just shy of their second anniversary. I found the wood type shortly after their engagement, printed the type just after their wedding, and then procrastinated on finding a frame. Doh! Typed locked up in the chase before going in the press. The moral of the story is that it's never too late. I'm happy I finally shared this gift with my friends but really a wedding date is a great deadline for finding and making the perfect gift. I've learned my lesson and now I let go of the guilt. Yes, sometimes I feel guilty about my craft productivity. 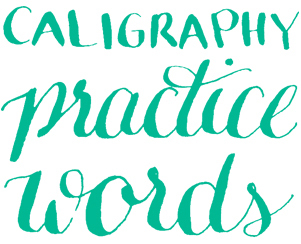 Posted in Letterpress and tagged with letterpress, calligraphy, wood type, wedding gift. October 9, 2013 by Shasta Garcia. 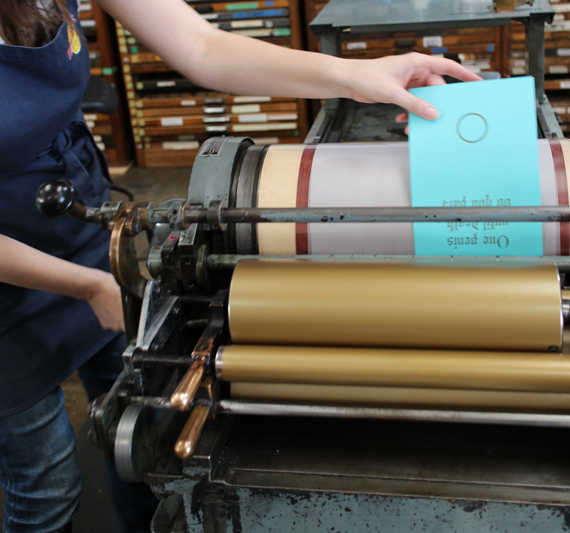 I’ve made the joke many times that as soon as I purchased my letterpress all my friends got engaged. Heather and Adam were that first set of friends. As a little back story Adam made the most elaborate proposal to Heather. It was a scavenger hunt through San Francisco and Berkeley. All along the way, myself included, different friends hid clues for Heather to discover leading to the final proposal. It was full of creativity, attention to detail, and love. The same was true for their wedding except this time as a collaborative process for the bride and groom. For the wedding invites we worked together to incorporate elements of Yosemite because besides being a special place for the couple it was the location of their wedding. If you've been to Yosemite then you know about the bears penchant for breaking and entering to steal your unkempt food. There are signs everywhere making sure you are "Bear Aware". This became our running theme (gag). I love a good pun. I wish I could take credit for this one but it was all Heather and Adam. I initially wrote a Yosemite version of the classic k-i-s-s-i-n-g nursery rhyme which got them thinking about levity for the invite. While their wedding was a celebration of their love for each other it was also a reflection of how much they love their family and friends. They found ways to include everyone in the day. Really in the entire weekend. I thought I'd go to Yosemite to do some hiking but in reality I went and did some eating. There were lot's of dining moments to connect with their family and friends. It's been slightly over a year since the wedding so this seem liked the perfect time to share this project. We'll pretend it wasn't just buried in my to do list. We created lapel pins for guests to wear and identify each other in the camp sites. After the initial invitation printing there was still plenty of paper and envelopes so I printed notecards that could be used for thank yous or other correspondence. I cut and reused one of the printing plates which is one of my little tricks for saving on plate making costs. The complete invitation suite was comprised of three 5.5 x 4 inch flat cards revealing more details about the wedding with each subsequent card. Printed on French Paper, Madero Beach 100lb Cover from the Speckletone line. Envelopes are Gumdrop Green from the Pop-Tone line. It was a funny coincidence that last year I was simultaneously working on two invites with the same color scheme, though they ended up being very different in character. Posted in Letterpress and tagged with letterpress, wedding invitation, yosemite. June 20, 2013 by Shasta Garcia. When starting this project the one request I had from the groom was to incorporate the Chicago skyline. Florencia the bride and my former roommate had a few other comments; “I like polka-dots, I like birds, no matchy matchy”. The Polka-dots were no surprise to me since she even had them on her dress. I promise polka-dots on a wedding dress is just the right amount of sophistication and whimsy. That was my personal goal for the invite design. For the other requests, rather than just putting a bird on it, I used one of her mothers bird sketches. Growing up Florencia always liked her bird drawings and I was happy to use something extra sentimental in the invitation. I suggested the orange envelopes to keep things from being to matchy matchy and because I couldn’t imagine orange not being part of Florencia’s wedding. Living together she brought the gift of orange into my life and I’ve embraced it as a color I like to have around. As it should be, the final result was a reflection of both the bride and groom. I printed these invites with the assistance of Florencia in March and attended the wedding in early May. 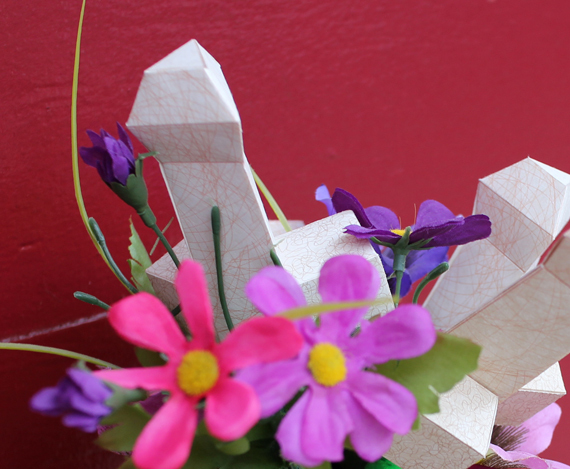 I supplied files for Florencia to produce some extra items for the wedding. 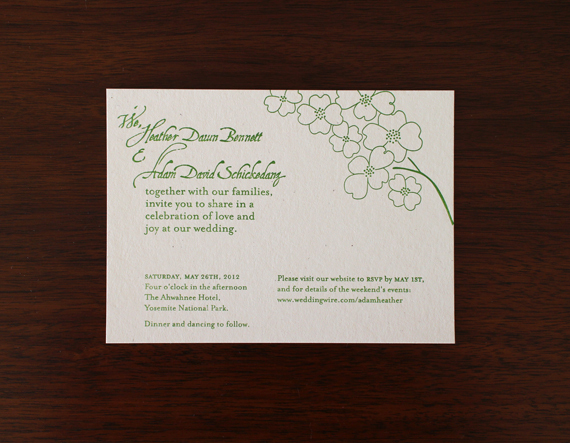 Posted in Letterpress, Paper and tagged with Polka-dot, Wedding Invitations, Chicago, put a bird on it, letterpress. June 26, 2012 by Shasta Garcia.